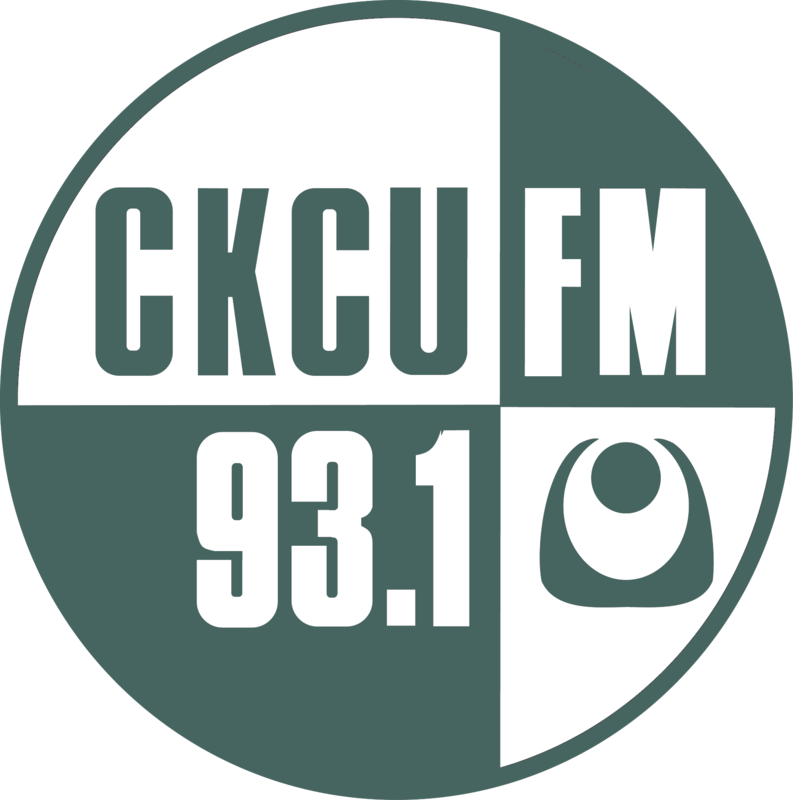 We Stood Like Kings as interviewed on new CKCU program, Hexon Bogon! We Stood Like Kings are a 4-piece instrumental band from Brussels. They have been together since 2011 and have released 3 albums via Dunk! Records & Kapitän Platte. They describe themselves as playing post-rock on silent movies. Even though their albums were written as soundtracks to silent films, they stand on their own and are thought provoking and moving. They are playing several shows this year across Europe, with one of those shows having occurred last night in Arlon, Belgium with 3-piece giants, Féroces who will actually be in town on April 17th. Today I have the pleasure to interview one of the members of We Stood Like Kings, the drummer for the band, Mathieu. He is with me on the phone now. He took time out of his busy schedule to do an interview with me and I’m totally grateful. Adriana: Hi Mathieu, thank-you for being on the show. Mathieu: Hello Adriana it’s my pleasure, Thank You for having me. Not too early for you? Adriana: Yes, It’s pretty early! Is it mid-morning where you are right now? Mathieu: It’s 10 o’clock in the morning. Adriana: How are you? How was the concert last night? What did the set-list consist of? Mathieu: I feel very good, very relaxed concert with a lot of people. We had much fun playing with Féroces. It was my first time playing with them and it was very powerful, awesome stage and quite some people! 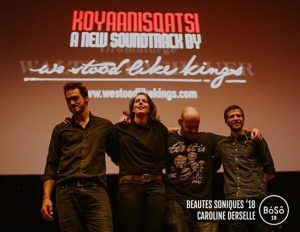 We played our latest album USA 1982 with the movie Koyaanisqatsi. Adriana: The band has been together now for 8 years. How did you all meet and what made the band decide to play instrumental music and more specifically, compose music for silent films? Mathieu: Actually the pianist and I have known each other since we were at school, we were already playing music together but just for fun and then some years after that we met again by total accident in the halls of university. When we then decided to start a band we decided to go for a project that would stand out instead of a pop project. I think at that time her studying Piano composing at the conservatory kind of directed our choice to more instrumental music. I was and still am very happy with that choice, it’s an infinite genre. The adding of movie to the project came a little bit later though. The idea came thanks to the film school of Brussels who wanted us to perform together with one of their movies they selected. They wanted us to score Berlin a city symphony as final show of their festival. After this first experience and this first score we decided to keep doing this because it was adding an extra dimension to our show and giving us an extra challenge. We really liked the concept and kept on doing it. Adriana: The piano, played by Judith stands out as the main instrument in your albums while the guitars and drums build around it. Was this a conscious decision or did it happen accidentally? Mathieu: Our sound as a band is definitely defined by the piano and the skills of Judith. But I never felt like we push the piano that it gets too much in front, we always try to have a good balance between all instruments. But it’s true that Judith has the most work live and many calm, emotional parts are done by a piano solo. but in my opinion if the piano stands out its because its not often done to have a classical piano sound as lead instead of a piano who just supports the melody or the singer. Adriana: I’m also in a band and a couple of years ago we were thinking of composing a soundtrack to a silent film. We had a hard time selecting a film and an even harder time getting a physical copy of the film. How does the band go about selecting the films? Mathieu: Yes I can relate to your problem. It is not easy to find the right movie to score. The first movie, Berlin ,was, luckily for us, given to us and for the second movie we decided to stay in black and white, which then already narrows down your search. Then you narrow down to movies who have the right length for an album. And then we narrowed down to documentaries because we didn’t want to work with a movie with real storyline to follow. In the end of our searches The sixth part of the world from dziga vertov seemed the best choice to us as we first wanted to do one movie per continent and this was a russian masterpiece. Was fitting perfectly in our concept. For Koyaanisqatsi it was something else, as then we didn’t want to continue in black and white, again having a non narrative documentary and this was one of the first who came up in our searches and talks and it was immediately taken as choice unanimously because of its beauty.. And also because it was continuing our idea of one movie per continent. For getting a physical copy of the movies, for the first two we were in contact with respective film museums who restored the movies, they made us sign a contract with them and in exchange gave us a bluray version we could use. We had to provide them with a list of our concerts each year and pay. 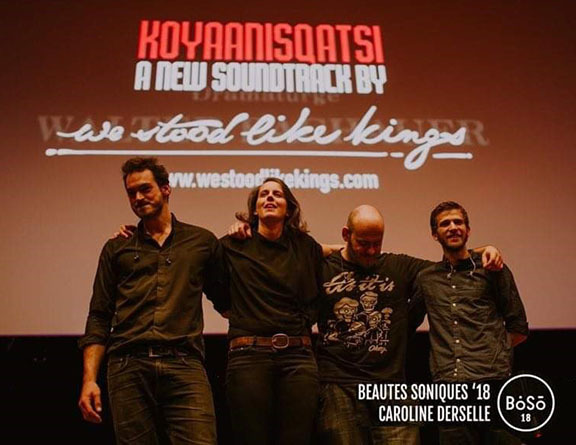 For Koyaanisqatsi we were directly in contact with the producers. Adriana: What is the process the band uses when composing a soundtrack? Do each of you watch the film on your own first, then as a band? Do you have the movie playing while composing? Do you compose as a band or is there one person who does the writing? Mathieu: First there is the process of cutting the movie in different parts. You have to know that we have a vinyl based label so we have to take into account that if we want to press on vinyl, we need to cut the movie first in two or four parts. Then inside those parts, we then try to figure out where to start and cut each song. Then when the structure is more or less fixed then starts the composing part. We always compose the music with the movie projected otherwise you can never know if what you’re playing fits to the images. Of course, we sometimes pre-compose melodies or parts without movie but in the end it has to fit so you can’t go far without it. Judith took a big role in the writing of the music but what’s awesome is that she never had to tell us what to do or to play, a lot of ideas were collective even though of course she is the musical brain behind We Stood Like Kings. Adriana: When my band was searching for a silent film, we had to be careful to choose a film deemed of public domain. Are you restricted by this and if not, how do you get around this? Mathieu: Well let’s say you are only restricted to public domain if you look for a movie free of rights. And even then! Some old movies have been restored like Berlin and a Sixth part of the world so you still have to pay screening rights. Of course we are restricted in that, this plays an important role in the end decision for a movie: if the screening rights are too expensive it can be a deal breaker. Like for example, we had the idea to do Fantasia, but no way, the screening rights were way too expensive. Adriana: Your last three albums formed a trilogy based on the subject of fragile empires. Are you currently working on another album and will it also be a trilogy? Mathieu: It won’t be a trilogy but we are working on a new album of classical reworks. Actually for the moment we are also quite busy with presenting the last three albums to school kids in Belgium. We were selected by a youth program to present one piece of each album to kids so we’re quite busy with that. So we are really busy with that, touring from school to school and presenting our albums and we always have a talk with the kids afterwards about our approach to music and they can come around our instruments and play sometimes. So it’s really nice and very different for us as bands to play for kids. Adriana: What bands/composers influence each of you the most in your individual musical journeys and as a band? Mathieu: As our description says we feel more leaning to Chopin and Pink Floyd mixed up with bands like Mogwai, Explosions in the sky and Godspeed. It’s always hard to choose couple artists and to say you are really influenced by them. I think we try our maximum to do our own thing and not to listen too much to what others do or did before. Judith of course is the classical input in the band, while Colin and Phil more studied jazz and also like harder music and me.. I’m the free electron I listen to almost everything from classic to hard-core. There’s a lot of variety in the band. Adriana: The band has toured extensively throughout Europe. Do you hope to tour outside of Europe and if yes, what countries would you like to go to? Adriana: What can fans expect from the band this year or the near future? Mathieu: Well we are currently working on classical reworks. We took one composer from each era and are doing one piece of each which we then modernize and put into our music genre. It’s an interesting project for us as it’s not really composing but it has more of a cover approach. We are also talking with the museum of Copenhagen to maybe score the Prince Achmed, the first ever made cartoon from 1926 and we are also waiting for a good to go from the producers of Baraka, it kind of looks like a more modern version of Koyaanisqatsi but again we are waiting for the go ahead from the producers. But the last two are not sure yet. Adriana: Usually when I do an interview my last question is often a ‘what if’ scenario and it usually refers to effect pedals and if you could only have three, what would they be. I’m going to change it a bit and ask if you could build your own kit, and money was no object, what would the kit include? Mathieu: To be honest.. I’m very good for gear at the moment, I just bought myself a new drums so I’m very happy with it and cymbal wise I’m very good too. But if I can change your question, instead of for myself I would, if really money was not a problem, i would love to pay for the best world wide booker there is, or the best producers for our next album. That’s what i would really like for us at the moment. We spend so much time organizing for tours, everything that a band needs we do it all ourselves so I would be really happy to lift off some weight off the shoulders of the band. Sometimes we feel like having an external vision on the band could be really helpful but they are always hard to get or very expensive. Adriana: Thank-you so very much Mathieu for taking the time talk with me. Especially since you had a gig last night. It is greatly appreciated. Please give my regards to the rest of the band and I hope to hear from you soon.